If you take a look at many of the cutting-edge designs for mobile User interfaces on Behance or Pinterest, you find a ring, arc or circle graph. The Apple Watch’s fitness activity app uses them extensively. 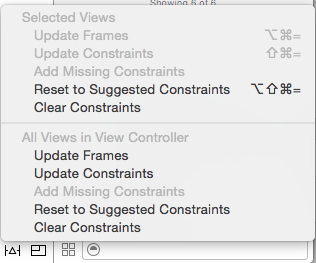 Yet, if you scroll down the object library in Xcode it is a not a control to drag and drop into Xcode. You have to make it yourself. Actually, it’s not difficult to draw your own ring graph using Core graphics. In this post, we’ll walk through the process of making and using an arc graph. Start by making a new Single-view project by pressing Command-Shift-N on the keyboard or File>New>Project.. from the drop down menu. Name the project SwiftRingGraph. 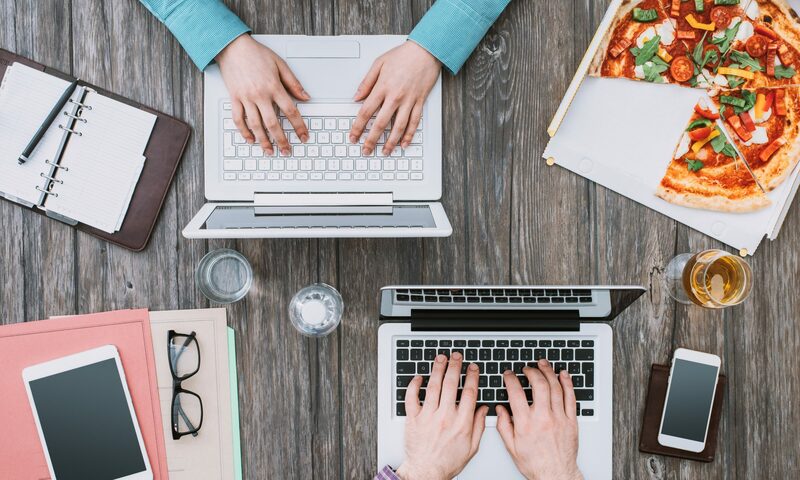 Use Swift as the language and make it a Universal app. Save the file somewhere convenient. You can leave it like this if you want to run in the iPad simulator. I’ll add some auto layout to let this work on any device. 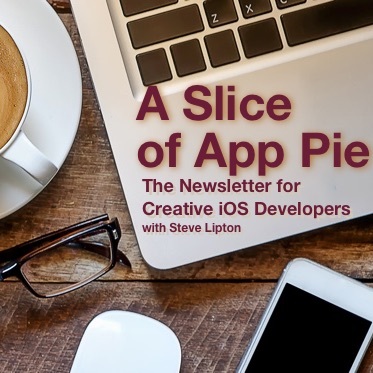 If you haven’t used auto layout before, I suggest reading the Basic Auto Layout post or viewing the video, but you can follow along even if you don’t. Select the 0% label. Pin up 0 and right 0 points. Add the constraints. 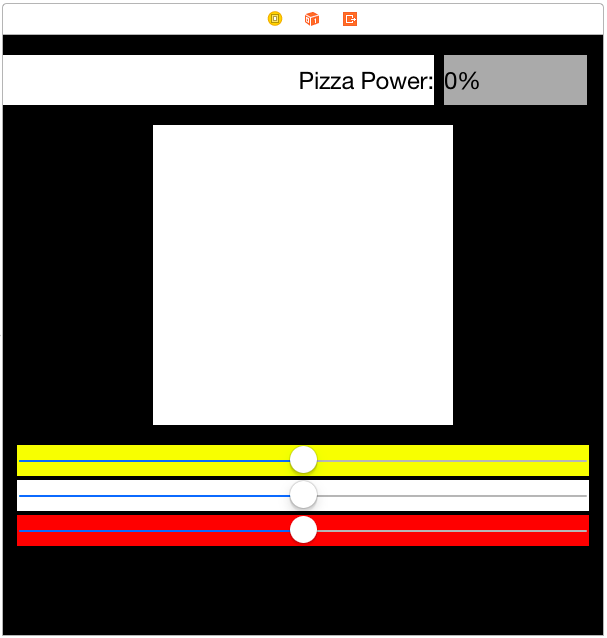 Control drag from the 0% label to the Pizza Power Label. 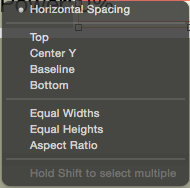 In the menu that appears, select Equal Widths and Equal Heights. 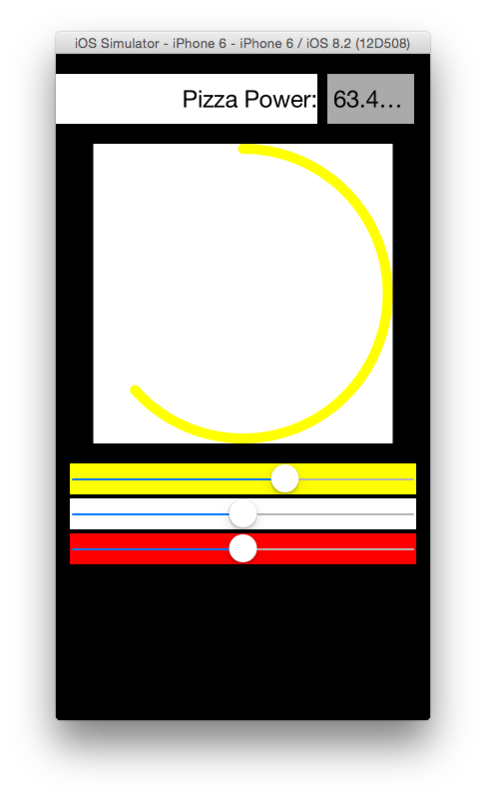 Pin the yellow slider up 20, left 0 and right 0 points. Pin the white slider up 5, left 0 and right 0 points. Pin the red slider up 5, left 0,and right 0 points. Select the View. Click the pin menu and set it for 300 width and 300 points height. 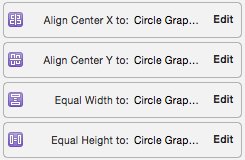 Click the alignment menu and check on Center Horizontally, making sure the values are 0 points. In the resolver, select Update Frames. 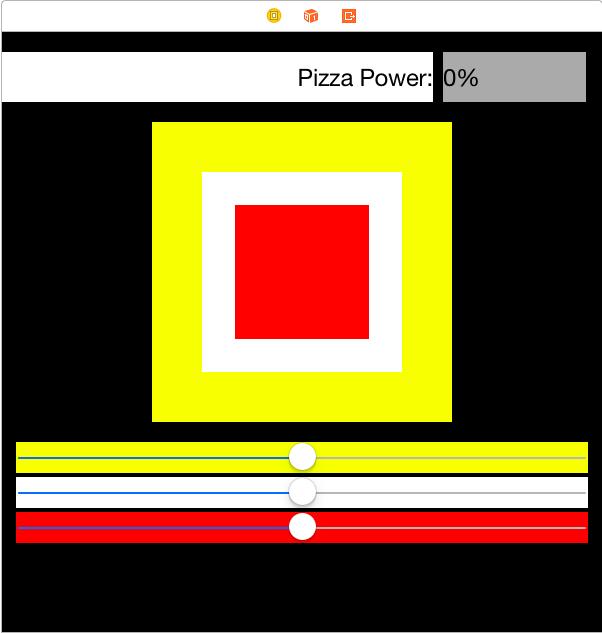 Select the Pizza Power Label. In the Equal width to 0% constraint, click Edit. @IBOutlet weak var percentLabel: UILabel! @IBOutlet weak var circleGraph: CircleGraphView! Add the following properties to the code. We have the property endArc which is where the arc ends. We have a property arcWidth which will tell us how wide a line we want, with a default value of 10. Both values are CGFloat. Everything has a type CGFloat in Core Graphics, so keeping our properties typed correctly saves us a lot of work later. We also added two color properties to set the color of the graph, and gave them some default values. Drawing always requires some math and geometry. Add the following to the drawRect method. Ring or arc graphs are circular arcs drawn in the view. We need a center point, an angle on the circle to start and an angle on the circle to end. Core graphics does not work in degrees for angles, but radians. If you don’t remember your geometry or trigonometry lessons, radians describes angles around a circle as a measurement of pi. A full revolution around a circle is 2 times pi. There is a Double constant M_PI in Xcode we can use for calculations. We would need to convert it to CGFloat and multiply by 2 every time we use it. I calculated it once as a constant to use in calculations later. Looking at line 3 above, you’ll see how handy this is. Any point on the circle is a fraction of a whole circle. If I use a CGFloat between 1 and 0, multiplied by fullCircle, I can describe any angle on the circle. Line 3 sets start by moving backwards a quarter of a circle. We do this because people think in clocks. The starting point should be 12 o’clock. The starting point of 0 in Core Graphics is at the 3 o’clock position, so we move back a quarter to start our line at the top. 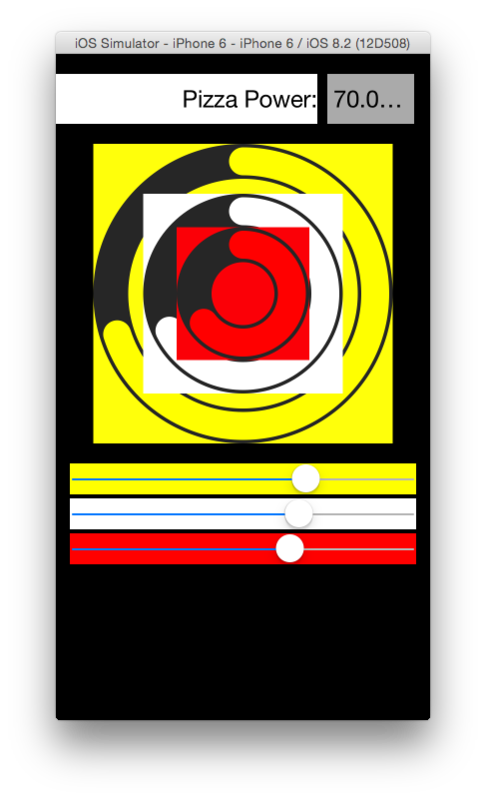 Line four multiplies the endArc property by our full circle constant giving us where the arc ends. Since we shifted the arc a quarter of a turn we add that as an offset. 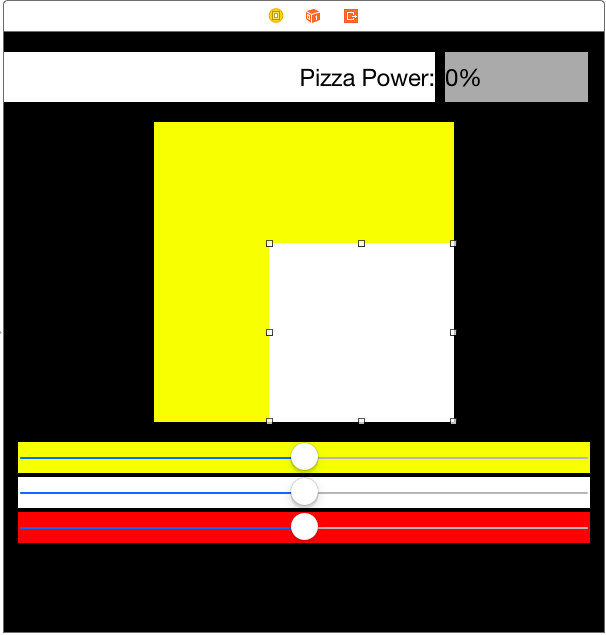 Core Graphics has a set of functions to get dimension information from a CGRect rectangle. Two of these are CGRectGetMidX() and CGRectGetMidY(). I could type in these functions every time I need them, but I find having a CGPoint tends to be useful and better documentation. The size of our circle or arc is set by the radius. We are going to automatically fit a circle into the view, based on the smallest side of the view and the width of the arc. We first figure if the width or length is shorter. We take that shorter side. We subtract the width of the line, so it does not go outside of the view, clipping it. We divide that by two, since we need a radius. We now have a line that will always fit inside any size view. //starting point for all drawing code is getting the context. All the functions require the context. Line 2 sets the line width and line 3 the end caps on the line. Since we are drawing a line, we have a few choices what the end of the line looks like. In this case we use the constant kCGLineCapRound to make a round end for the line, just like the Apple Watch uses. There is also kCGLineCapButt and kCGLineCapSquare for straighter lines. If kCGLineCapRound produces a syntax error, you may be on Swift 2.0. Use GCLineCap.Round or .Round instead if it doesn’t work. The version with k‘s are for Objective-C. The last line sets the line color. Core graphics does not use UIColor. However, UIColor has a property which is a CGColor, which is what we do here. Line 1 adds an arc to the path. Paths are invisible, and may have several lines, arcs, and curves added to them. We have only one arc. End the path and draw the line from the path with the CGContextStrokePath function. We used a property observer to call setNeedsDisplay any time we change the endArc value. Every time we change the arc length in the slider, we run the code. We set value of the slider as a percentage by multiplying by 100. Build and run. The line is a bit thin for the space. also in viewDidLoad, add code to make a bigger line:. Build and run. We now start with an arc on the device. 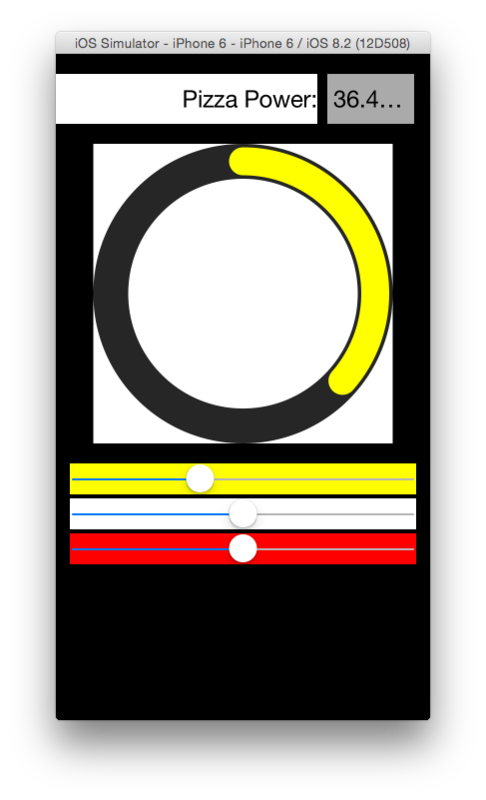 This makes a dark circle behind the yellow arc. Drawing happens from the bottom of the view up, We need to place this code before the code for the arc in order for it to behind the arc. 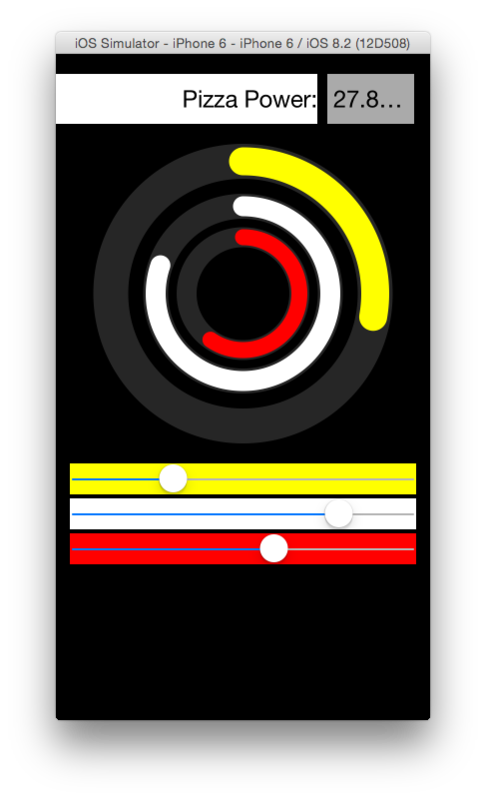 I changed the start and end for 0 and fulCcircle, creating a full circle. Back in viewController, in viewDidLoad, set the property arcBackgroundColor to make a very dark gray track. Let’s add some nested arcs like the activity graph for the Apple watch on your phone or iPad . Change the current view’s background color to yellow. 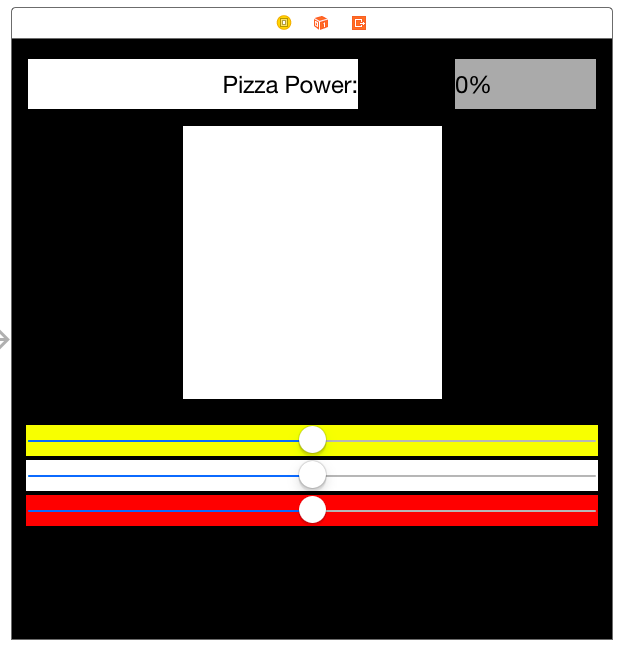 Now drag a view out on the storyboard directly over the current view keep the background of the new view white. Resize the new view so you can see the yellow of the first view. The white view, when placed on teh yellow view is now a subview of the yellow view. Control drag diagonally up and left until it highlights the current view. Shift-Select Center X, Center Y, Equal Heights and Equal Widths. Keeping the new view selected, Go to the size inspector. 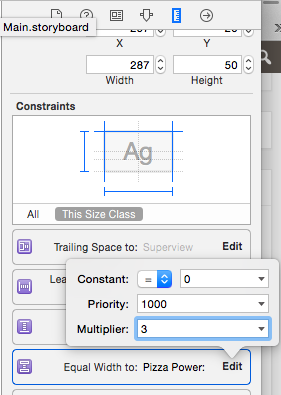 Edit the constraints so they all have 0 for a constant. Update the constraints for the frame. It will fill in the square. 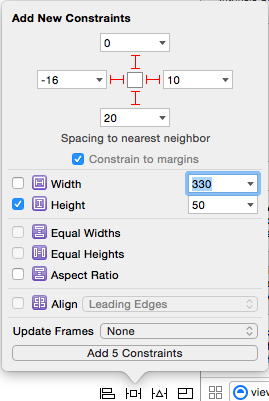 Change the Equal Width and Equal Height to a multiplier of 2:3 or 3:2 whichever makes a smaller view. We have nested the white view inside the yellow view. Repeat these steps to nest a smaller red view inside the white view. You should end up with this. Select the white view. in the identity inspector, change the class to CircleGraphView. Select the red view. Change the class to CircleGraphView. Open the assistant editor and add actions for sliderWhite for the white slider and sliderRed for the red slider. Add and outlet whiteCircle for the white view and redCircle for the red view. Build and run. Move the sliders around. This looks a little messy. The opaque backgrounds of the views is getting in the way of each other. Change the background color for all three views to Clear Color in the storyboard. Run again. Now that looks classy! Note we never touched the view code to do this. We built a sufficiently flexible class with properties to control the graph, then added the graphs to the super view. This is one way of making multiple arcs. You can also do so as part of a single view, but I will leave that up to the reader to implement. Here is the code for the lesson. There is a download of a more robust version at the end of another lesson: where we add pie wedges and some better background track techniques. //  Created by Steven Lipton on 3/10/15. @IBOutlet weak var whiteGraph: CircleGraphView! @IBOutlet weak var redGraph: CircleGraphView! 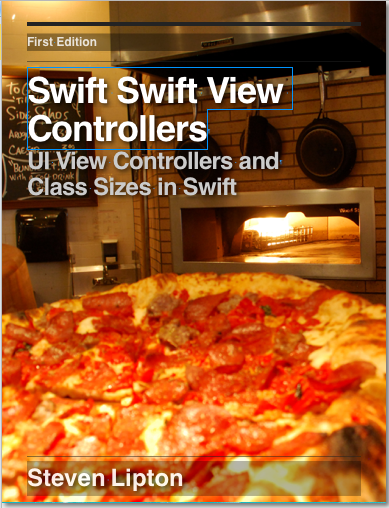 Could you send me this swift project? Thank you! the files necessary will be up on the site later today. the source code files and instructions on how to use them are here in the whole code section: https://makeapppie.com/2015/03/14/happy-pi-day-add-a-pie-to-the-ring-graph/ this is a more robust version of the ring graph, with some more features. Thanks for this very useful tutorial! 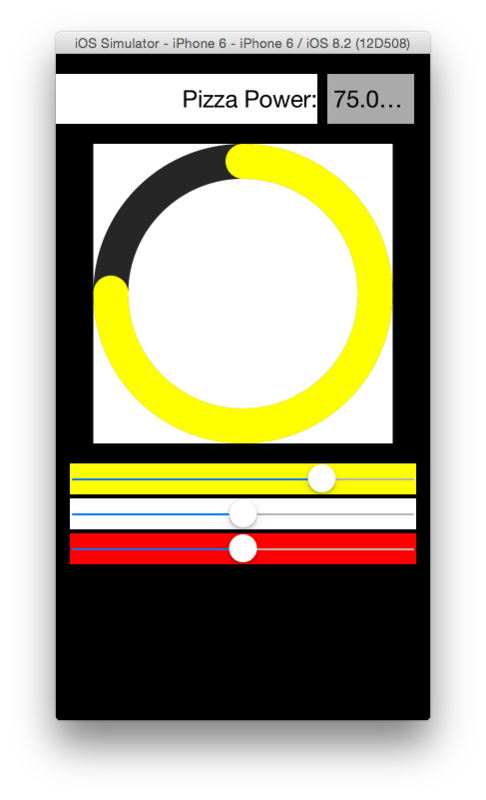 Do you know how we can draw rings with gradients like those we see on the Apple Watch? I’ll discuss gradients and shadows next week. Already got two topics for this week, but that will dovetail nicely into what I have planned for my watch tutorials. I’m afraid I can’t find a solution the would work in a post either. What I was working on, but had to give up is to make a series of segments. and change the segment color each time. Simple in theory, not so simple in practice. Sorry I wasn’t able to help more. Looks like kCGLineCapRound has been replaced by CGLineCap.Round if anyone runs into errors on that line. Good catch! The change doesn’t show in the documentation until pre-release versions in Swift, So I’m assuming this is a 2.0 change, at least officially. I’ll include a note in the text about the change. Thanks. Thanks! I’ll have to look at it. Thanks for the tutorial, I liked it but I am trying to add something more on this. I am trying to add gradient on each circle. For ex: there is that white circle. I want the same circle but with some gradient on it and my problem is that the cornors are not coming as arc. Could you please help me to achieve that. Thanks a lot in advance. I never got this working. Basically you have to make a poly line with each segment a different color. I enjoyed this tutorial but do have a question… How would you make the the spectrum be larger than 1… or how would you make the portion of the graph that is larger than 1 overlap the original line or arc… I have been messing around with it for quite a while and I am having trouble figuring this out. I haven’t played with that. I tried getting gradients to work, and didn’t get far.